Joann Fabric has the latest assortment of crafting supplies and fabric for your projects. Whether it be creating dazzling jewelry or lapidary projects, scrapbooking your favorite summer photos, crocheting a blanket for baby, making a beautiful quilt for a loved one during the winter months, or another project entirely your own, Joann has all the supplies your looking for in a one-stop shop. Simply, join TopCashBack and sign up for a free account. 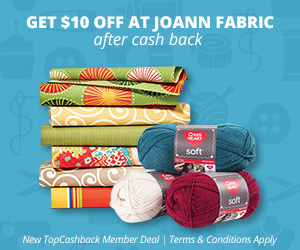 Once signed up, you'll be directed to the Joann freebie offer page. Click ‘Get Offer' and it'll take you to Joann Fabric. Add any item or items that totals to $10 (excluding sales tax and shipping) to your cart and checkout as normal. This is a free in store pick up offer. Within 14 days, your account will be credited with your free $10 in cash back. Promotion runs through December 31, 2019.